Well, the weather man called for rain. So we cancelled our camping trip. Our week went well. We are spending a ton of time at our garden. Having dinner a bit early and heading out after dinner, the kids play and we work. My husband and I are really enjoying our garden and working in it. Awww Happy early birthday to your son! I bet he'll love a Ninja cake. 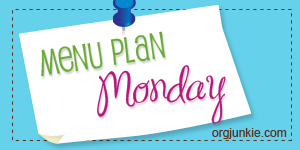 I'm stopping by for a visit from Menu Plan Mondays. Happy Birthday to your little ones! Time for cake! I think gardening is a terrific couple project. My husband and I had alot of fun with our patio garden. Don't you love Pinterest? Between MPM and PInterest our meals are never boring.